Early in the Second Age of Middle-earth, elven smiths forge nine Rings of Power for mortal men, seven for the Dwarf-Lords, and three for the Elf-Kings. Soon after, the Dark Lord Sauron makes the One Ring, and uses it to attempt to conquer Middle-earth. Following the Last Alliance of Elves and Men's fall, the Ring is seized by Prince Isildur; and after Isildur was killed by orcs, the Ring lies at the bottom of the river Anduin for over 2,500 years. Over time, Sauron captures the Nine Rings and transforms their owners into the Ringwraiths. The One Ring is discovered by Déagol, whose cousin, Sméagol, kills him and takes the Ring for himself. The Ring twists his body and mind, and he becomes the creature Gollum (Peter Woodthorpe). Hundreds of years later, Bilbo Baggins (Norman Bird) finds the Ring in Gollum's cave and takes it back to the Shire. Decades later, during Bilbo's birthday celebration, the wizard Gandalf (William Squire) tells him to leave the Ring for his relative Frodo (Christopher Guard). Bilbo reluctantly agrees, and leaves the Shire. Seventeen years pass, during which Gandalf learns that evil forces have discovered that the Ring is in the possession of a Baggins. Gandalf meets with Frodo to explain the Ring's history and the danger it poses; and Frodo leaves his home, taking the Ring with him. He is accompanied by three hobbit friends, Pippin (Dominic Guard), Merry (Simon Chandler), and Sam (Michael Scholes). After a narrow escape from the Ringwraiths, the hobbits eventually come to Bree, from which Aragorn (John Hurt) leads them to Rivendell. Frodo is stabbed atop Weathertop mountain by the chief of the Ringwraiths, and becomes sickened as the journey progresses. The Ringwraiths catch up with them shortly after they meet the elf Legolas (Anthony Daniels); and at a standoff at the ford of Rivendell, the Ringwraiths are swept away by the river. At Rivendell, Frodo is healed by Elrond (André Morell). He meets Gandalf again, after the latter escapes Saruman (Fraser Kerr), who plans to ally with Sauron but also wants the Ring for himself. At a council, Bilbo, Gandalf, and others debate the One Ring, and Frodo volunteers to go to Mordor, where the Ring can be destroyed. Thereafter Frodo sets off from Rivendell with eight companions: Gandalf; Aragorn; Boromir (Michael Graham Cox), son of the Steward of Gondor; Legolas; Gimli (David Buck) the dwarf; and Frodo's three hobbit companions. Their attempt to cross the Misty Mountains is foiled by heavy snow, and they are forced into Moria. There, they are attacked by orcs, and Gandalf falls into an abyss while battling a balrog. The remaining Fellowship continue through the elf-haven Lothlórien, where they meet the elf queen Galadriel (Annette Crosbie). Boromir tries to take the Ring from Frodo, and Frodo decides to continue his quest alone; but Sam insists on accompanying him. Boromir is killed by orcs while trying to defend Merry and Pippin. They are captured by the orcs, who intend to take them to Isengard through the land of Rohan. The hobbits escape and flee into Fangorn Forest, where they meet Treebeard (John Westbrook). Aragorn, Gimli, and Legolas track Merry and Pippin into the forest, where they are re-united with Gandalf, who was reborn after destroying the balrog. The four then ride to Rohan's capital, Edoras, where Gandalf persuades King Théoden (Philip Stone) that his people are in danger. Aragorn, Gimli, and Legolas then travel to the Helm's Deep. Frodo and Sam discover Gollum stalking them in an attempt to reclaim the ring, and capture him; but spare his life in return for guidance to Mount Doom. Gollum eventually begins plotting against them, and wonders if "she" might help. At Helm's Deep, Théoden's forces resist the orcs sent by Saruman, until Gandalf arrives with the absent Riders of Rohan, destroying the orc army. The Metro-Goldwyn-Mayer office was located in the same building, and Bakshi spoke to then-president Dan Melnick. "I thought he would understand what The Rings meant, because UA did not." Bakshi and Melnick made a deal with Mike Medavoy at United Artists to buy the Boorman script. "The Boorman script cost $3 million, so Boorman was happy by the pool, screaming and laughing and drinking, 'cause he got $3 million for his script to be thrown out." However, after Melnick was fired from MGM, the deal fell through. Bakshi then contacted Saul Zaentz (who had helped finance Fritz the Cat) to ask him to produce The Lord of the Rings, and Zaentz agreed. Before the production started, the original three-part adaptation was negotiated down to two parts at United Artists, and Bakshi met with Tolkien's daughter Priscilla to discuss how the film would be made. She showed him the room where her father did his writing and drawing. Bakshi says, "My promise to Tolkien's daughter was to be pure to the book. I wasn't going to say, 'Hey, throw out Gollum and change these two characters.' My job was to say, 'This is what the genius said.'" It's not that important to me how a hobbit looks. Everyone has their own idea of what the characters look like. It's important to me that the energy of Tolkien survives. It's important that the quality of animation matches the quality of Tolkien. Who cares how big Gandalf's nose is? The tendency of animation is just to worry about the drawing. If the movie works, whether you agree about Bilbo's face or not, the rest becomes inconsequential. Bakshi's major artistic influences on the film were classical illustrators such as Howard Pyle and N. C. Wyeth; he stated that no contemporary illustrators were an influence on the style of the film. The film is a clash of a lot of styles like in all my films. I like moody backgrounds. I like drama. I like a lot of saturated color. Of course, a big problem was controlling the artists so they drew alike. How do you have 600 people draw one character alike? The tendency is to want to let the artist have some freedom but then someone would leave off a hat or horn on a hat on a character. [...] I think we've achieved real illustration as opposed to cartoons. Artistically, we can do anything we want. An early draft of the screenplay was written by Chris Conkling, who told the bulk of the story in flashback, from Merry Brandybuck's point of view. After Bakshi and Zaentz saw Conkling's first draft, fantasy author Peter S. Beagle was called in for a rewrite. According to the website of publisher Conlan Press, Beagle wrote multiple drafts of the script for only $5,000, on the strength of promises from Saul Zaentz to hire him for other, better-paying projects afterward. Zaentz later reneged on these promises. The film makes some deviations from the book, but overall follows Tolkien's narrative quite closely. Of the adaptation process, Bakshi stated that elements of the story "had to be left out but nothing in the story was really altered." The film greatly condenses Frodo's journey from Bag End to Bree. Stop-overs at Farmer Maggot's house, Frodo's home in Buckland, and the house of the mysterious Tom Bombadil deep in the Old Forest are omitted. Maggot and his family and Bombadil and his wife Goldberry are thus all omitted, along with Fatty Bolger, a hobbit who accompanied Frodo at the beginning. According to Bakshi, the character of Tom Bombadil was "dropped" because "he didn't move the story along." Additionally, the character Glorfindel is amalgamated with Legolas. Publicity for the film announced that Bakshi had created "the first movie painting" by utilizing "an entirely new technique in filmmaking." Much of the film used live-action footage which was then rotoscoped to produce an animated look. This saved production costs and gave the animated characters a more realistic look. In animation historian Jerry Beck's The Animated Movie Guide, reviewer Marea Boylan writes that "up to that point, animated films had not depicted extensive battle scenes with hundreds of characters. By using the rotoscope, Bakshi could trace highly complex scenes from live-action footage and transform them into animation, thereby taking advantage of the complexity live-action film can capture without incurring the exorbitant costs of producing a live-action film." I was told that at Disney the actor was told to play it like a cartoon with all that exaggeration. In Lord of the Rings, I had the actors play it straight. The rotoscope in the past has been used in scenes and then exaggerated. The action becomes cartoony. The question then comes up that if you're not going to be cartoony, why animate? [...] It is the traditional method of rotoscoping but the approach is untraditional. It's a rotoscope realism unlike anything that's been seen. It really is a unique thing for animation. The number of characters moving in a scene is staggering. In The Lord of the Rings, you have hundreds of people in the scene. We have cels with a thousand people on them. It was so complex sometimes we'd only get one cel a week from an artist. It turned out that the simple shots were the ones that only had four people in them. For the live-action portion of the production, Bakshi and his cast and crew went to Spain, where the rotoscope models acted out their parts in costume. During the middle of a large shoot, union bosses called for a lunch break, and Bakshi secretly shot footage of actors in Orc costumes moving toward the craft service table, and used the footage in the film. Many of the actors who contributed voices to this production also acted out their parts for rotoscoped scenes. The actions of Bilbo Baggins and Samwise Gamgee were performed by Billy Barty, while Sharon Baird served as the performance model for Frodo Baggins. Other performers used on the rotoscoping session included John A. Neris as Gandalf, Walt Robles as Aragorn, Felix Silla as Gollum, Jeri Lea Ray as Galadriel and Aesop Aquarian as Gimli. Although some cel animation was produced and shot for the film, very little of it appears in the final film. Most of the film's crowd and battle scenes use a different technique, in which live-action footage is solarized (per an interview with the film's cinematographer, Timothy Galfas, in the documentary Forging Through the Darkness: the Ralph Bakshi Vision for The Lord of the Rings) to produce a more three-dimensional look. In a few shots the two techniques are combined. Bakshi claimed he "didn't start thinking about shooting the film totally in live action until I saw it really start to work so well. I learned lots of things about the process, like rippling. One scene, some figures were standing on a hill and a big gust of wind came up and the shadows moved back and forth on the clothes and it was unbelievable in animation. I don't think I could get the feeling of cold on the screen without showing snow or an icicle on some guy's nose. The characters have weight and they move correctly." After the Spanish film development lab discovered that telephone lines, helicopters, and cars could be seen in the footage Bakshi had shot, they tried to incinerate the footage, telling Bakshi's first assistant director that "if that kind of sloppy cinematography got out, no one from Hollywood would ever come back to Spain to shoot again." Making two pictures [the live action reference and the actual animated feature] in two years is crazy. Most directors when they finish editing, they are finished; we were just starting. I got more than I expected. The crew is young. The crew loves it. If the crew loves it, it's usually a great sign. They aren't older animators trying to snow me for jobs next year. Although he continued to use rotoscoping in American Pop, Hey Good Lookin', and Fire and Ice, Bakshi later regretted his use of rotoscoping, stating that he felt that it was a mistake to trace the source footage rather than using it as a guide. Mike Ploog (co-creator of Werewolf by Night) was one of numerous staff taking a role in animation on this film. Ploog also was involved in other Ralph Bakshi animations, notably Wizards and Hey Good Lookin'. The film score was composed by Leonard Rosenman. Bakshi wanted to include music by Led Zeppelin but producer Saul Zaentz insisted upon an orchestral score because he would not be able to release the band's music on his Fantasy Records label. Bakshi later stated that he hated Rosenman's score, which he found to be too cliché. In Lord of the Rings: Popular Culture in Global Context, Ernest Mathijs writes that Rosenman's score "is a middle ground between his more sonorous but dissonant earlier scores and his more traditional (and less challenging) sounding music [...] In the final analysis, Rosenman's score has little that marks it out as distinctively about Middle Earth, relying on traditions of music (including film music) more than any specific attempt to paint a musical picture of the different lands and peoples of Tolkien's imagination." The film's score was issued as a double-LP soundtrack album in 1978. A limited collector edition was created by Fantasy Records as a picture disc double LP featuring four scenes: The Hobbits leaving Hobbiton, The Ringwraiths at Bree, Gandalf and the Balrog, Journey with the Orcs. In 2001, the album was reissued on compact disc, with bonus tracks. "I told them they can't drop the Part One, because people are going to come in thinking they'll see the whole film, and it's not there. We had a huge fight, and they released it as Lord of the Rings. So when it came to the end, people were stunned in the theater, even worse than I ever realized they would be, because they were expecting to see the whole film. People keep telling me I never finished the film. And I keep saying, 'That's right!'" "Had it said 'Part One,' I think everyone would have respected it. But because it didn't say 'Part One,' everyone came in expecting to see the entire three books, and that's where the confusion comes in." The Film Book of J.R.R. Tolkien's the Lord of the Rings, published by Ballantine Books on October 12, 1978, still referred to the sequel in the book's inside cover jacket. Bakshi states that he would never have made the film if he had known what would happen during the production. He is quoted as saying that the reason he made the film was "to save it for Tolkien, because I loved the Rings very much." Bakshi also stated that he felt that the film "took more out of me than I got back." "[The film] made me realize that I'm not interested in [adapting another writer's story]. That the thing that seemed to interest me the most was shooting off my big mouth, or sitting in a room and thinking about how do you feel about this issue or that issue and how do you get that over to an audience, was the most exciting part of my life." Eventually, the Rankin-Bass studio, the company behind the 1977 animated adaptation of The Hobbit, released The Return of the King in 1980 as a sequel to The Hobbit, but also completing the story begun in Bakshi's film by adapting the final novel, though the Rankin-Bass production offers no stylistic continuation from the earlier film. The Lord of the Rings was a financial success. The film grossed $30.5 million at the box office, based on a $4 million budget. The film was nominated for both the Hugo and Saturn Awards for Best Dramatic Presentation and Best Fantasy Film, respectively. Leonard Rosenman's score was nominated for a Golden Globe for Best Original Motion Picture Score, and Bakshi won a Golden Gryphon award for the film at the Giffoni Film Festival. Critics were generally mixed in their responses to the film, but generally considered it to be a "flawed but inspired interpretation". Review aggregation website Rotten Tomatoes, which compiles reviews from a wide range of critics, gives the film a score of 50% based on reviews from 40 critics with the consensus: "Ralph Bakshi's valient attempt at rendering Tolkien's magnum opus in rotoscope never lives up to the grandeur of its source material, with a compressed running time that flattens the sweeping story and experimental animation that is more bizarre than magical." Frank Barrow of The Hollywood Reporter wrote that the film was "daring and unusual in concept." Joseph Gelmis of Newsday wrote that "the film's principal reward is a visual experience unlike anything that other animated features are doing at the moment." Roger Ebert called Bakshi's effort a "mixed blessing" and "an entirely respectable, occasionally impressive job ... [which] still falls far short of the charm and sweep of the original story." Vincent Canby of The New York Times called the film "both numbing and impressive." David Denby of New York magazine felt that the film would not make sense to viewers who had not previously read the book. Denby wrote that the film was too dark and lacked humor, concluding that "The lurid, meaningless violence of this movie left me exhausted and sickened by the end." 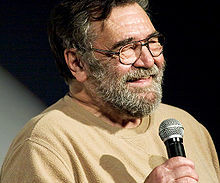 Michael Barrier, an animation historian, described The Lord of The Rings as one of two films that demonstrated "that Bakshi was utterly lacking in the artistic self-discipline that might have permitted him to outgrow his limitations." The film has been cited as an influence on director Peter Jackson's The Lord of the Rings film trilogy. After initially denying having seen Bakshi's film, Jackson admitted to having first encountered The Lord of the Rings via Bakshi's film, stating that the film was a "brave and ambitious attempt." In another interview, Jackson stated that he "enjoyed [the film] and wanted to know more." Bakshi is quoted as saying "Peter Jackson did say that the first film inspired him to go on and do the series, but that happened after I was bitching and moaning to a lot of interviewers that he said at the beginning that he never saw the movie. I thought that was kind of fucked up." On the audio commentary for the DVD release of The Lord of the Rings: The Fellowship of the Ring, Jackson acknowledges one shot, a low angle of a hobbit at Bilbo's birthday party shouting "Proudfeet! ", as an intentional homage to Bakshi's film. Bakshi is quoted as saying that he had "mixed feeling[s]" about Jackson's adaptations, although he had not seen the films. "In some respects I feel good that Peter Jackson continued and went on, and in some respects I feel bad that Saul Zaentz, the producer, and various people never called me, thanked me, or asked my permission to do the movie. [...] [Nor] has anyone sent me a bottle of wine, on the tremendous success. [...] But I have more feelings on the business side of that than I do on the creative side. I'm glad Peter Jackson had a movie to look at—I never did. And certainly there's a lot to learn from watching any movie, both its mistakes and when it works. So he had a little easier time than I did, and a lot better budget." The film was adapted into comic book form with artwork by Spanish artist Luis Bermejo, under license from Tolkien Enterprises. Three issues were published for the European market, starting in 1979, and were not published in the United States or translated into English due to copyright problems. 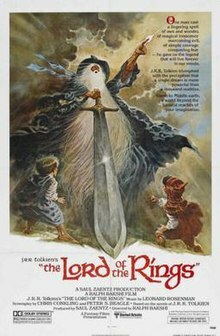 Bakshi's film sparked enough interest in Tolkien's work to provoke not only an animated TV special produced by the Rankin-Bass animation studio based on The Return of the King, but a complete adaptation of The Lord of the Rings on BBC Radio. For this broadcast, Michael Graham Cox and Peter Woodthorpe reprised their roles of Boromir and Gollum, respectively. Warner Bros. (the rights holder to the post-1973 Rankin-Bass library and the pre-1990 Saul Zaentz theatrical library) has released The Hobbit, The Lord of the Rings and The Return of the King on VHS and DVD, both packaged separately and as a boxed-set "trilogy" of films. While the VHS version ends with the narrator saying "Here ends the first part of the history of the War of the Ring. ", the DVD version has an alternate narration: "The forces of darkness were driven forever from the face of Middle-Earth by the valiant friends of Frodo. As their gallant battle ended, so, too, ends the first great tale of The Lord of the Rings." The Lord of the Rings was released in a deluxe edition on Blu-ray and DVD on April 6, 2010. The Lord of the Rings was selected as the 36th greatest animated film by Time Out magazine, and ranked as the 90th greatest animated film of all time by the Online Film Critics Society. ^ Beck, Jerry (2005). "The Lord of the Rings". The Animated Movie Guide. Chicago Review Press. pp. 155–156. ISBN 978-1-55652-591-9. ^ a b "The Lord of the Rings, Box Office Information". Box Office Mojo. Retrieved January 27, 2012. ^ a b c d e f g h i j Beck, Jerry (2005). "The Lord of the Rings". The Animated Movie Guide. Chicago Review Press. p. 155. ISBN 978-1-55652-591-9. ^ Gaslin, Glenn (November 21, 2001). "Ralph Bakshi's unfairly maligned Lord of the Rings". Slate. ^ Maçek, J. C., III (August 2, 2012). "'American Pop'... Matters: Ron Thompson, the Illustrated Man Unsung". PopMatters. ^ a b c d e f g h i j k l Korkis, Jim. "If at first you don't succeed ... call Peter Jackson". Jim Hill Media. Retrieved 2007-01-09. ^ Pepper, Jeffrey. "The Myth of Walt Disney's Lord of the Rings". 2719 Hyperion. Archived from the original on October 18, 2012. Retrieved July 30, 2012. ^ a b c d e f g Robinson, Tasha (January 31, 2003). "Interview with Ralph Bakshi". The Onion A.V. Club. Archived from the original on October 12, 2007. Retrieved 2007-01-09. ^ a b c Riley, Patrick (July 7, 2000). "'70s Version of Lord of the Rings 'Devastated' Director Bakshi". Fox News. Archived from the original on February 5, 2007. Retrieved 2007-01-09. ^ a b Croft, Janet Brennan. "Three Rings for Hollywood: Scripts for The Lord of the Rings by Zimmerman, Boorman, and Beagle". University of Oklahoma. Archived from the original on September 3, 2006. Retrieved 2007-01-09. ^ "Beagle/Zaentz FAQ". Conlan Press. Archived from the original on February 9, 2007. Retrieved 2007-01-09. ^ a b Gibson, Jon M.; McDonnell, Chris (2008). "The Lord of the Rings". Unfiltered: The Complete Ralph Bakshi. Universe Publishing. pp. 148, 150, 154–55. ISBN 0-7893-1684-6. ^ "The Lord of the Rings (1978) – Full cast and crew". Internet Movie Database. Retrieved 2007-08-08. ^ "The Lord of the Rings – deleted scenes". The Official Ralph Bakshi website. Archived from the original on 2007-04-16. Retrieved 2007-08-08. ^ "The Lord of the Rings – gallery image". The Official Ralph Bakshi website. Retrieved 2007-08-08. ^ Gallagher, John A. (1983). "The Directors Series: Interview with Ralph Bakshi (Part One)". Archived from the original on May 20, 2011. Retrieved 2007-08-08. ^ a b "Michael Ploog". The New York Times. ^ Segundo, Bat (May 21, 2008). "The Bat Segundo Show #214: Interview with Ralph Bakshi". Edward Champion's Reluctant Habits. Retrieved 2008-06-25. ^ Mathijs, Ernest (2006). Lord of the Rings: Popular Culture in Global Context. Wallflower Press. ISBN 1-904764-82-7. ^ "The Lord of the Rings soundtrack details". SoundtrackCollector. Retrieved September 1, 2007. ^ produced by Saul Zaentz ; directed by Ralph Bakshi. (October 1978) . The Film Book of J.R.R. Tolkien's the Lord of the Rings. Ballantine Books. ISBN 0-345-28139-X. ^ a b c d "Interview with Ralph Bakshi". IGN Filmforce. Archived from the original on February 18, 2006. Retrieved 2007-01-09. ^ Sacks, Terence J. (2000). Opportunities in Animation and Cartooning Careers. McGraw-Hill. p. 37. ISBN 0-658-00183-3. ^ "Awards for The Lord of the Rings (1978)". Internet Movie Database. Retrieved December 19, 2007. ^ "The Lord of the Rings". Rotten Tomatoes. Fandango Media. ^ Ebert, Roger (January 1, 1978). "Review of The Lord of the Rings". Chicago Sun-Times. Retrieved 2007-01-09. ^ Canby, Vincent (November 15, 1978). "Review of The Lord of the Rings". New York Times. Retrieved 2007-01-09. ^ Barrier, Michael. Hollywood Cartoons: American Animation in Its Golden Age. Oxford University Press US, 2003. 572. Retrieved on October 15, 2009. ISBN 0-19-516729-5, ISBN 978-0-19-516729-0. ^ Peter Jackson, as quoted at the Egyptian Theater in Hollywood, on February 6, 2004. Audio Archived October 9, 2006, at the Wayback Machine; Retrieved on 2007-08-22. ^ "Peter Jackson interview". Explorations. Barnes & Noble Science Fiction newsletter. October–November 2001. ^ "J.R.R.Tolkien comics". J.R.R. Tolkien miscellanea. Retrieved 2007-08-22. ^ "Comic creator: Luis Bermejo". J.R.R. Tolkien miscellanea. Retrieved 2007-08-22. ^ "ASIN: B00005UM49". Amazon.com. Retrieved 2007-08-04. ^ "ASIN: B00005RJ2W". Amazon.com. Retrieved 2007-08-04. ^ "Ralph Bakshi's Lord of The Rings- BluRay & DVD Release Slated for April 6, 2010 Release". Bakshi Productions. Archived from the original on January 18, 2014. Retrieved August 4, 2007. ^ Adams, Derek; Calhoun, Dave; Davies, Adam Lee; Fairclough, Paul; Huddleston, Tom; Jenkins, David; Ward, Ossian (2009). "Time Out's 50 greatest animated films, with added commentary by Terry Gilliam". Time Out. Archived from the original on October 11, 2009. Retrieved 2009-11-11. ^ "Top 100 Animated Features of All Time". Online Film Critics Society. Archived from the original on July 22, 2011. Retrieved December 10, 2010.